#WriteHereWriteNow: Can we learn to write better? I was on assignment in Stockholm last week and looking for an idea. We obsess, as writers, about the words. We analyse the craft and devour books about the technique. Writing in the Guardian recently, the columnist Ian Jack discussed the perennial question: can writing be taught? Writing is like riding a bicycle: its techniques are best not dwelt on. For me, it’s about the ideas. If the ideas are poor then, no matter how erudite the words, then the writing will not shine. If there’s no angle, no hook, no reason to grab the attention of the reader, then it’s just more words on a page. And we have enough of those already. The writer David Quantick says ideas are gold. In his book, How to Write Everything, he describes the craft of coming up with good ideas as even more crucial than the craft of writing itself. A good idea is simply one that inspires something you are capable of writing, something that might sustain. But can we learn to have good ideas? We’ll consider this at the next #WriteHereWriteNow meeting. As for me, wandering around Stockholm in search of a good story? 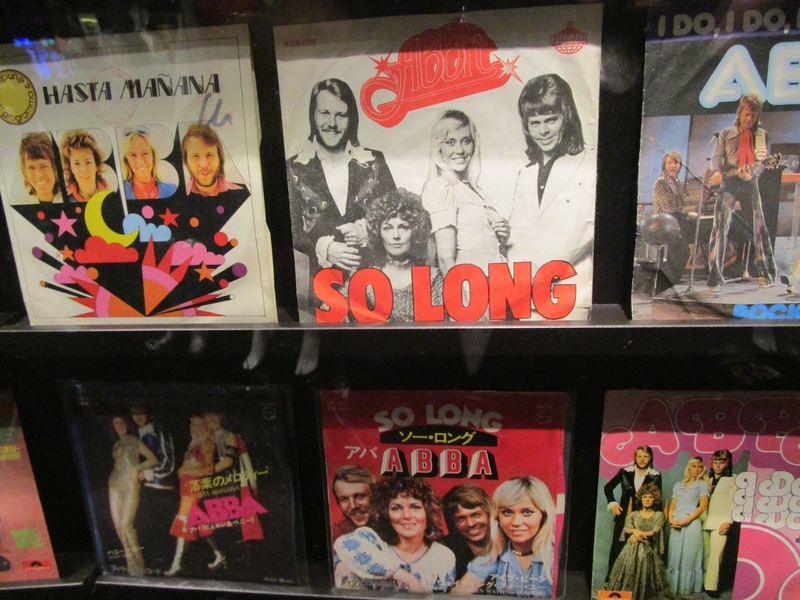 Well, let’s just say a visit to the Abba Museum [pictured above] and a night at the Pop House music-themed hotel may just make a Scandi-pop story about Eurovision-crazy Sweden. Liked this? Try A new writing group comes to Storyhouse, Chester. I think that good ideas are subjective to the person who’s come up with the idea and they come out of always thinking creatively about life- I must admit I can’t understand people who say I can’t think of an idea to write about! Thanks for kicking off, Jo. What do the others think? I’m not sure. How many times have you heard someone say, ‘I’ve got a great idea for a book,’? And then great idea disappears under the weight of too many adjectives or really long, uninvolving sentences. I wonder if great writing can make a passable idea seem amazing? I think its useful to write down ideas when the pop into your head. I need to do that more often as I get ideas and then forget them! True. Anyone else got any useful tips? I’m a firm believer in the statement that ‘everyone has a story to tell.’ Personally, I feel that all ideas will go through the refining process in the writer’s mind. If the passion can outlast the doubt, then as long as there’s enthusiasm, I believe said idea can be transmitted from pen to paper.. Writing can go from good to great with perseverance and rigid editing. True, editing is important. How do the others feel about being edited? Depending how close you are to your idea and writing editing can be a mixed blessing. Sometimes very useful and necessary, sometimes very disheartening. Can we learn to have good ideas? Yes, but I think development and structure has to be solid enough to hold them. I always have a notebook handy to write down ideas. My main issue is time. I’m terrible at starting something and never finishing them. I think it was Einstein said something along the lines of genius is 1% inspiration and 99% perspiration and I truly believe that to be true. You can have the ‘perfect’ idea but if you do not have the skill to keep a reader with you as you tell a tale, then they won’t stick around to hear it. I feel like writing is like any other skill – some will have a natural talent and others can work hard to develop it. Like any skill though, you have to “use it or lose it”. I have dozens of notebooks and pages on my phone with hastily scrawled (or heavily mistyped) germs of ideas when a thought or observation has struck me and I think I’d like to explore it more. Getting them from ideas and concepts to the next stage is somewhat more tricky! Thanks everyone for sharing your thoughts. Feel free to post comments or share links before the meeting on Thursday. Over time I’ve learnt that creativity is like a muscle and you need to use it regularly! But the most important thing is to just start. Once I start brainstorming a topic, ideas and inspirations keep popping into my head long after I’ve put the pen down. I do think we can learn to have good ideas. I think there are games and exercises that can be used to stimulate creative thinking and like Sarah-Jayne said it’s a muscle and should be used regularly. I think the issue arises when people expect to have a fully fleshed out idea just spring into their subconscious, whereas I have always found that I’ll get the start of an idea, but after kicking it around in my head and looking at it from different angles and challenging it is what makes a good idea become a great idea. Lots of food for thought here. Can we learn to have good ideas? I think it’s important first just to let yourself have lots of ideas – good and bad, then somehow process them down into the ones you want to pursue. Whether it’s good will depend on the context – it may be a good idea for an article, but a less good idea for a book, perhaps a short story can turn into a novel or perhaps it’s best left as it is. Perhaps we can learn to recognise when it’s worth carrying on with something and when it’s not? The success of the idea is also subjective to the reader – some will like it, some won’t. I believe everyone can have good ideas though regardless of what they’ve been taught. As for editing – it can be a hard process, but taken positively can be a useful. I’ve learnt about how my writing is coming across to others and learnt to let go and be a little less precious over every word. I’m terrible at editing my own work though – so it’s helpful to improve that too! !